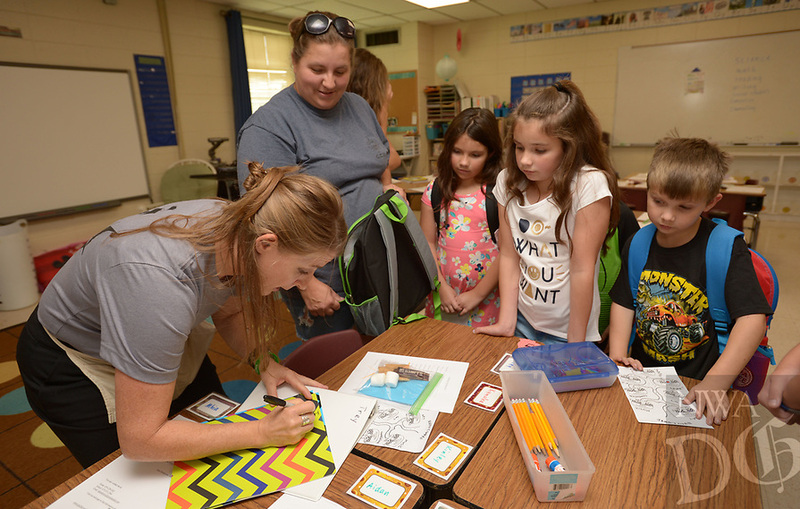 Amy Henderson (left), a second-grade reading teacher at Greenland Elementary School, helps Christina Vaughan (from left) and her children Bella, 8; Ally, 10; and Caiden, 6; Thursday, Aug. 9, 2018, during an open house at the school. Henderson was preparing Vaughan's son Trey for his first day of school. The district starts new teachers with a bachelor's degree at $34,513, one of five Northwest Arkansas school districts that start new teachers at $35,000 or less.